Postcrossing Spotlight: Helena2008 from France! News, updates, and all kinds of goodies and stories from the postal world! Blog > Postcrossing Spotlight: Helena2008 from France! Hi Héléna! How did you come across Postcrossing? What got you hooked? Do you have any other interesting hobbies? I collect stamps with animals and flowers. Postcrossing is a wonderful way to discover very beautiful stamps! Sometimes postcrossers use an envelope and they add some stamps inside the envelope just for me. It’s very nice and I always thank them. I’m very interested about languages, especially English. I learn English at school, and also at home with a free internet website named Duolingo. When I’ll be older, I would like to own a “learning languages store”. I’d like to be an English teacher for adults. Show us your mailbox, your mailman/mailwoman, your postoffice or the place where you post or keep your postcards! My mailman has a lot of work because of me! He is so used to deliver postcards to me, that sometimes he puts in my mailbox postcards which are not for me! When it happens, I take them and put them in the mailbox of my neighbors. 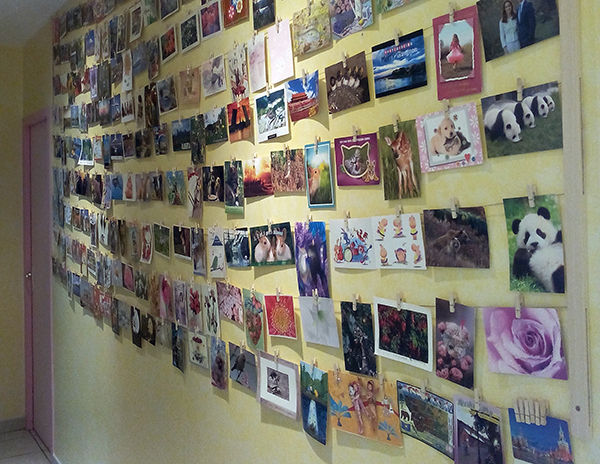 At home, I have a wall where I put my postcards. Show and tell us about your favorite received postcard to date, and what makes it special. My favorite postcard was the one I have received from the city Helena, Montana, USA. It was so strange to see my name written on a postcard!! I also love to receive postcards of rabbits. 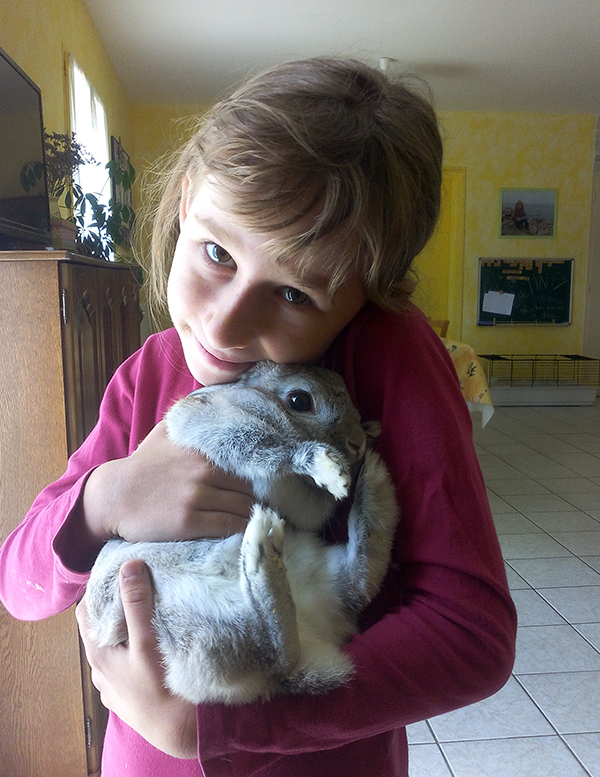 I have a rabbit, so I’m crazy about these nice and soft animals. What is it your favorite part of the Postcrossing process? My favorite part of postcrossing is to go to my mailbox and see if there is a postcard for me :) The more exciting is when I receive an envelope. It’s wonderful to open it and to discover what it is inside. Some postcrossers are very nice with me and they send to me some girly stickers, stamps, or coins from their country. It’s very kind and it makes me very happy. Have you been surprised by any place that you have received a postcard from or sent a postcard to? Yes, I have been surprised many times by the places that I have received postcards. With a swap, I have received a postcard from Syria. It was from a girl who is almost the same age as I am. It’s hard to think about her and about the war in her country. I often think about this little girl and I hope she is fine. Have you met any other members in real life? This trip was the best moment of my life! After that, I have invited this postcrosser to France. He came in my house during summer 2017. It was great to show him my country and to see each other again. We are still in touch, and my mom and I are planning a trip next summer, to go back to Helena. I already know that it’s going to be awesome! Is there anything that you are passionate about? I hope I'll draw Héléna's address one day. Would be great to send a card to such a passionate postcrosser. Reading Héléna's spotlight brightened my morning. It's so fantastic to see a young person take an interest in sending/receiving postcards and then go the extra mile to organize a Postcrossing gathering. Bravo! to Héléna's parents as well. wow, very impressed! The kid got so many nice interaction with world....so nice! Your passion for Postcrossing is inspiring! I hope to draw your name one day and send you a lovely postcard from America! I wish you the happiest of Postcrossing! Lovely story Helena! We are lucky to have you in Postcrossing! 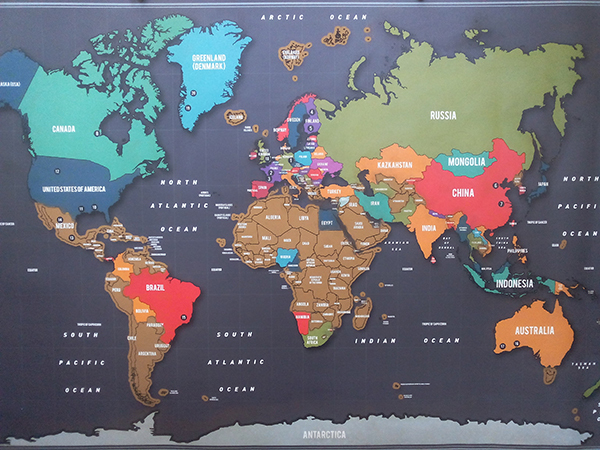 The world is better because you are in it! I wish I was like you when I was your age. God bless you, little angel. Hope all your wishes are fulfilled. Give me your address and i will be so happy and glad to send you a little package ! Hello Helena, thank you for sharing your love of Postcrossing with us and for telling your story so beautifully. I hope someday, I will be able to send you a postcard to add to your collection. Best wishes and I hope your mailbox continues to be filled with joy. Bonjour Helena, what a lovely story about you. 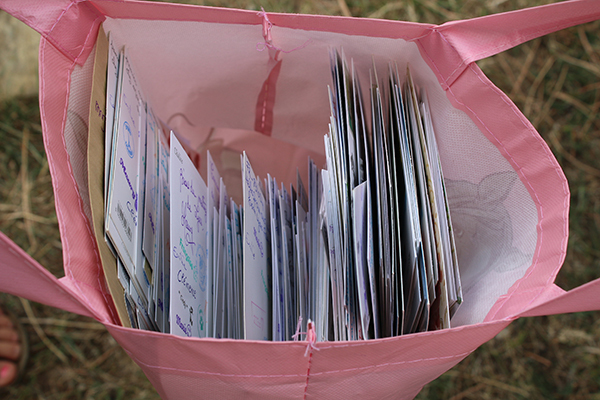 I remember I have sent you a card a while ago and I wish you all the best for the future and always a happy mailbox. I hope you receive many postcards in the future. One day I may receive your name. I wish you well in your life. What a cutie! A really interesting, refreshing and encouraging story. You have long and happy life ahead, world is big and generous. With Postcrossing things turn even better! Such a wonderful young lady. I think, Postcrossing is a great hobby for parents and kids to do together. This is a heartwarming story! What a great story He'le'na, I wish you many postcards in your mailbox and many trips around the big lovely planet earth. Keep on smiling and I hope to get your address one day so I can show you my beautiful country. Love and peace from italy. I love this story, thank you for sharing with us. I so enjoyed reading Helena's story - it put a smile on my face & warmed my heart. This is what Postcrossing is really about! I hope someday you can come to Australia and visit me. What a wonderful story - Helena is so sweet! I wish her the very best and hope her name appears in my "postcards to send" basket soon! Nearly at the same day I got a postcard from Marie, Helena's Mom, and Helena got my postcard with a rabbit. An interesting coincidence. Hi and I think it’s great to exchange postcard with you ! Would you like to be my pen pal ? Hi Helena, I can't wait to send you a card or receive one from you. What a great story, I love it and keep going, OK! What a cool girl she is! I loved reading this! Bonjour Helena, it is nice to know that you have a deep passion for receiving and sending postcards. I hope you get a postcard from North Korea very soon? May you inspire many more young people to join this amazing club. Au Revoir!!! What a sweet story! So glad Helena got to vist her namesake city! Hope one day I can send postcard to you or your rabbit 🐇. I adore your enthusiasm, Helena! Such and inspiration! 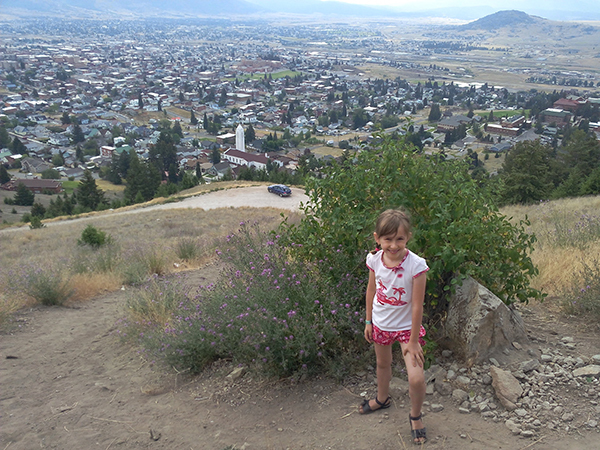 And how fun for Helena, Montana to get to be highlighted. Montana is a wonderful place. May your dreams come true! Love your story Helene! And I'm thrilled that you had the opportunity cultures, beauty and friendship with those around the world. Keep on exploring! Well done Helena, what a brilliant interview. I hope you get the north Korea postcard soon! Hi, Helena! 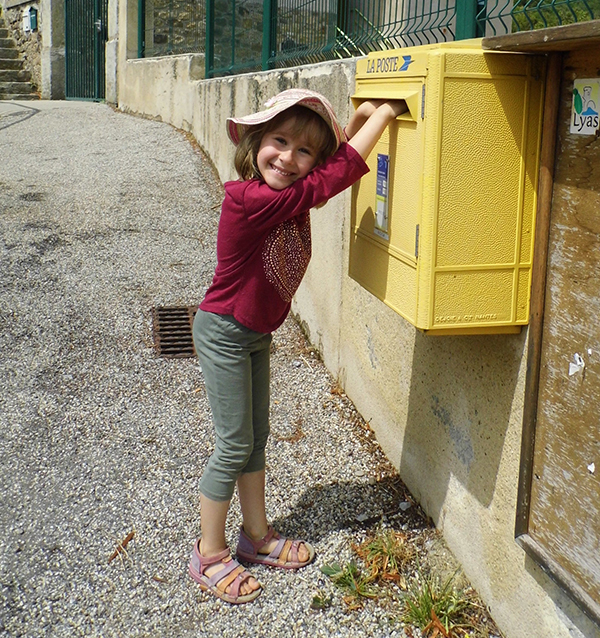 It's great that you're so small, but you love postcrossing! I also live in a small village, and no one but me is engaged in postcrossing... Our postman at first was very surprised when one of the first postcards for me came to the post office. My address was misspelled and the postman didn't understand English ... But time has passed, and now, when I receive postcards, the postman brings them to me. great, sweet, lovely story from you. will send a swap postcard to you later...greetings from Malaysia! Truly this is the path to world peace! Thank you for posting such a happy story! A great post, perhaps there is hope for the world after all? I love seeing young Postcrossers on the site! It's so nice to have our next generation appreciate REAL mail ♥ Bless you, sweet Helena - I hope we can exchange cards one day in the future! Hi Helena from Florida! I loved reading your story. It is a fun hobby. Glad you joined us! France is a pretty place! I will also be happy to send you a card. Happy Postcrossing! I love this post from Helena! Many years ago, I studied in Auvergne (Clermont-Ferrand) and I hope to visit again some day. I hope we can trade cards some time! Nice to hear your story and your love for post crossing.I wish you all the best. Would like to send card and stamps to you..Continue to enjoy post crossing.. I love this spotlight, because I used to live in the area of Lyon and unfortunateky did not know that postcrossing meetings find place there... If I would have known that maybe I would have had the possibility to meet you! Big kisses anyway, Helena, and also greetings to your Mom! Hi Helena! Thanks for your interview. You are such an adventurer! Congratulations on being so brave, curious and passionate - I bet you will be for the rest of your life and will continue to have amazing travels and experiences. Keep enjoying life to the fullest! May all your dreams come true. Hello to Helena, your Family and your Postman. I am delighted your mom woke you and told you about Postcrossing. I especially like the way you display your postcards with clips...I began collecting postcards when I was about 12 (decades ago) and would pin the cards to my bulletin board before I acquired albums. (I can always tell which cards were among the first because of the pin holes) I am confident you will enjoy your postcard hobby for many years to come. You are a ray of sunshine! Wonderful story. Wishing you a full letter box! Love this spot light interview! I loved reading your post and I am also a little post crosser like you trying to collect stamps from each country in the world. Wish we both reach our targets soon in a fun way!! Loved reading this! I'm so happy she is enjoying Postcrossing! Amazing! I wish you everything best and a lot of beautiful postcards! trop mignonne elle dans la photo devant de la poste! This spotlight made me so happy. I love the enthusiasm!! Happiest of Postcrossings, Helena! A wonderful story. If we could invite more children to postcrossing I believe this world will be a better place soon. I too learned so many new things about other people. And I think this could make the world better. Dear Helena, hope you make lots of amazing memories, and we look forward to hearing the stories of your wonderful journey. Let the world unfold in front of your eyes! I just received a postcard from Helena, and I am so very pleased to learn even more about her through this article! She is a remarkable girl!